Pakistan as a country has been through a number of highs and lows since traumatic partition in 1947 and its cricket has followed the similar pattern in direct proportion, showing how this sport is embedded in social, political and cultural facets of the country. Initially dispersed, unrecognised, underfunded and weak, Pakistan’s cricket team grew to become a major force in world cricket. Pakistan cricket team is regarded as the most unpredictable and mercurial team. In this series of blogs we shall dig into social, political, cultural and sporting history of cricket in Pakistan. MCC’s 1951-52 tour was of India, Pakistan and Ceylon was just six weeks away and a big challenge confronted Kardar to build the team. MCC was the name under which England teams toured overseas until 1977. It was a contest between father and children of the game. 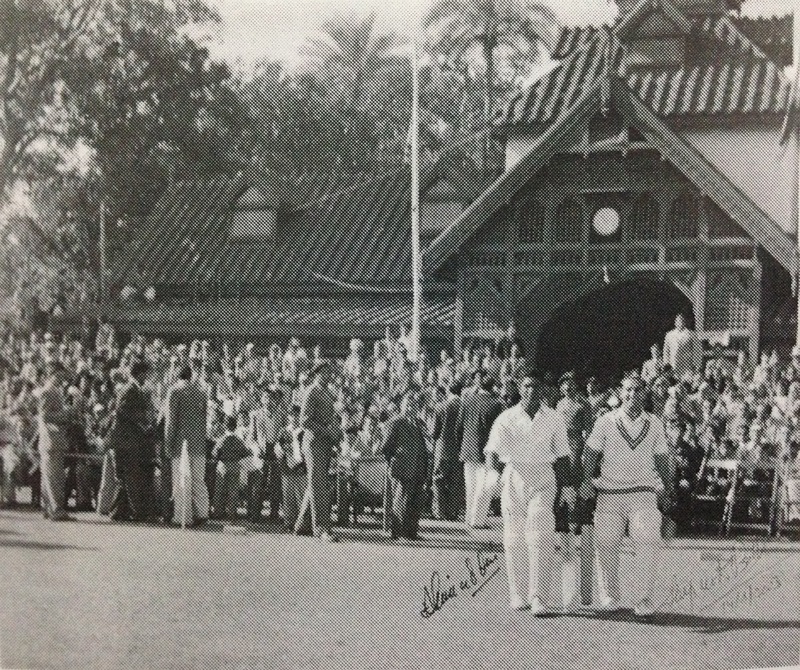 Pakistan’s first match against MCC was at Bagh-e-Jinnah, Lahore around mid-November 1951. MCC batted first on a lively pitch and struggled against pace of Khan Muhammad and leg-spin of Amir Elahi who took 5 and 4 wickets respectively. MCC was bowled out for 254. The first match also coincided with Kardar’s marriage to Shahzadi, sister to his team-mate Zulfiqar Ahmad. The MCC travelled to the wedding on special tongas from Faletti’s Hotel, where they were staying. If there is any match of more significance after the final of 1992’s Cricket World Cup for Pakistan cricket, it has to be second match of touring MCC in Nov-Dec 1951 at Karachi GymKhana Ground. Kardar was lucky to lose toss to MCC captain Nigel Howard. The ball swung nastily for 2 days and MCC were all out for 123 in first innings. It was time for Fazal Mahmood to shine at international level who took 6 wickets for 40 runs. However, Pakistan batting also fell apart and scored only 130 runs. MCC played much better in second innings and scored 291 runs thus giving a target of 285 runs for Pakistan to win, a task that looked beyond them. A 5ft 3in tall, weighing merely 60 kg approximately, with a crouching batting stance and ultra-defensive technique defied the MCC Test-class attack of Statham, Shackleton and Tattersall for 4 hours. 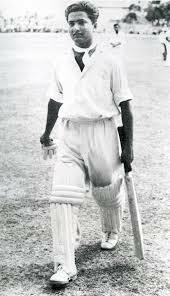 Hanif Muhammad announced himself to international cricket and scored 64 runs as opener. Later Kardar scored a critical half century and Fazal struck the winning runs for Pakistan. There was jubilation and celebration all around, as ground echoed with slogans of ‘Pakistan Zindabad!’ by some 20,000 spectators. There was political turmoil in the country and cricket seemed to be one thing that guaranteed unity and offered triumph. A consequence of this win was that Pakistan gained international recognition and was given full test status by the ICC on July 28, 1952. Pakistan cricket had arrived. 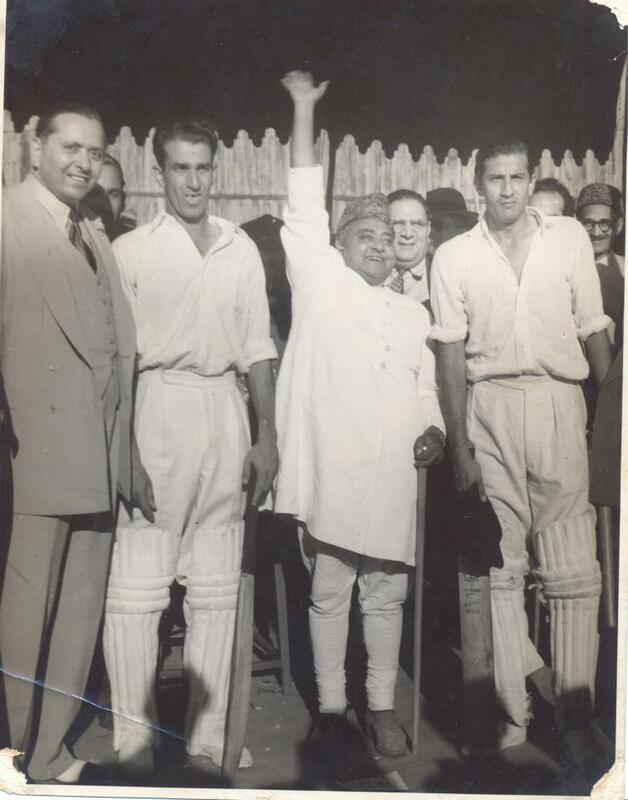 Kardar and Fazal with Prime Minister Khawaja Nazimudin after third match against MCC at Karachi. The romance with the game of cricket in Pakistan had begun. Pakistan toured India in 1952-53 for playing its first official test series. It was a team that was lacking in experience, only Kardar and the ageing Amir Elahi had played test cricket. 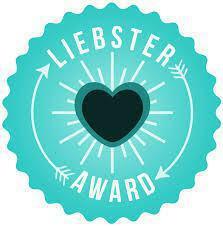 But what the team lacked in experience, it made up in enthusiasm. Pakistan lost the 5 match series 2-1, but not without notching up a spectacular win in the Lucknow test match, Pakistan’s first test victory. The match at Lucknow, second of the series, was played on a jute-matting wicket. Though he had never played on such a surface before, it suited Fazal Mahmood. Amarnath won the toss and decided India would bat first. By tea-time Pakistan bowled them out for 106. Fazal destroyed Indian batting and ended up with figures of 5-52. ‘He was man inspired to crush Indian batsmen’, recorded Kardar. In reply Pakistan posted score of 331 with the help of brilliant 124 by Nazar Muhammad. In second innings Fazal started from where he had left and took 7 more wickets as India lost by an innings. Indian team endured the hostility of crowd as abuse and stones were pelted by the crowd on team bus. The tour had generated goodwill on the both sides of the border. It has established Pakistan as a Test-Playing nation. Now Pakistan had something exciting to look forward to: MCC now extended Pakistan an invitation to play 4 tests in England, the home of cricket, the following summer. Named after Mohammad Ali Jinnah, the founder of Pakistan, who was known as “Quaid-e-Azam” (Great Leader), the Quaid-e-Azam Trophy (QAT) was introduced in the 1953-54 season to help the selectors pick the squad for Pakistan’s Test tour of England in 1954. 5 regional and 2 departmental teams competed in the first competition: Bahawalpur, Punjab, Karachi, North-West Frontier Province, Sindh, Combined Services and Pakistan Railways. If one has to identify the defining moment in history of Pakistan cricket it has to be Pakistan’s tour of England in 1954. Dubbed as “the babes of cricket” and mercilessly but affectionately patronised by the English media, Pakistani was to pull off one of the greatest upsets in cricket when it beat England at The Oval and drew the series. Pakistan team was in tatters as it approached the fourth Test match at the Oval: Kardar’s job on the line, dissension in the camp, ridicule in the press, and Pakistan’s position as a Test nation in question. In many teams everything would have fallen apart, but not Kardar’s babes. Kardar won the toss and defiantly chose to bat. Hanif got out LBW to Statham in first over. Statham, Tyson and Loader demolished Pakistan batting as Pakistan was bowled out for a disgraceful 133. However next morning Pakistan had its first piece of luck on tour as a monsoon-like outburst turned Oval into a lake and wiped out the day’s play. Fazal became lethal and took 6 England wickets for 53 runs in a spell of 30 consecutive overs, Hutton, May, Compton and Graveney among his victims. Mahmood Hussain played an excellent support role by taking 4 wickets. England was bowled out for 130. Pakistan was back in game. Second innings started badly again and Pakistan were 82-8 at one stage. Then Wazir Mohammad managed two gutsy partnerships with Zulfiqar Ahmad and Mahmood Hussain which put together crucial 82 runs. England needed 168 runs to win. Fazal bolwed the spell of his life and took 6 wickets for just 43 runs. England was bowled out for 143 and Pakistan won the match by 24 runs. Pakistan’s name had come prominently on the map of international cricket. The English were stunned and the newspapers wrote that England had been “Fazalled”. The team received the tumultuous reception when it arrived home. Cricket had ceased to be the game for the elite. It had become a national passion and the fortunes of the cricket team were to be forever linked to the pride and aspirations of the country. Very few Test series have been expected so eagerly as the India’s tour of Pakistan which followed the Oval test victory and few have disappointed so much. The scoring rate rarely exceeded 2 runs per over. At the end of the 5-match series ended 0-0, the first time in history that such a thing had ever happened. After the fourth drawn Test in Peshawar in 1954-55, the Ambala Tribune published match report entitled ‘Match Saved but Cricket Killed’. Both the 1952-53 and 1954-55 Test series took place against the background of threats and sabre-rattling speeches by political leaders. 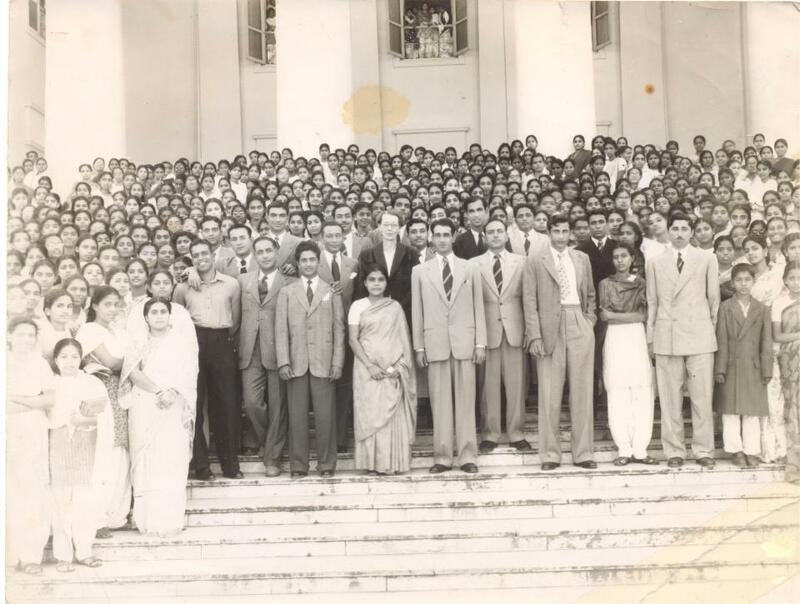 It was becoming evident that Tests between Pakistan and India had developed a unique sensibility. Those who were normal became slightly insane. Those who were already troubled were temporarily blinded with a kind of madness. Shuja-ud-Din (a future army colonel and historian of Pakistan cricket), right, going out with Alimuddin to open Pakistan’s second innings in the third Test at Lahore against India, 1955. (Source: ‘Wounded Tiger’ by Petper Oborne). 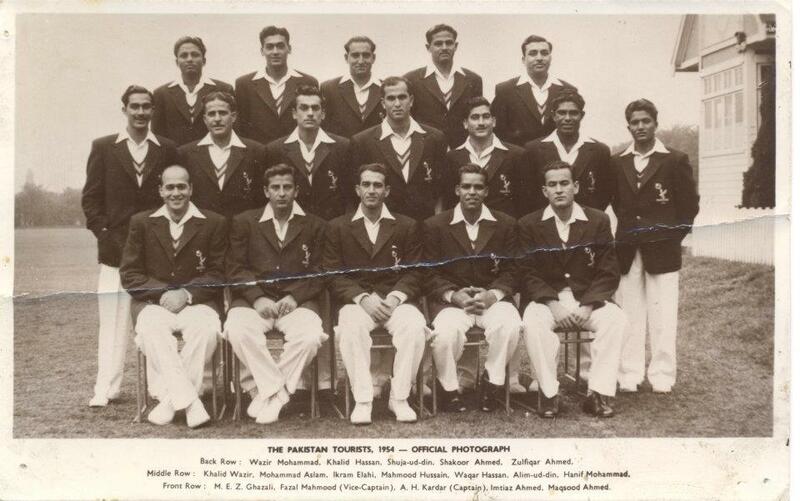 Unusually Pakistan faced two touring teams in the winter of 1955-56. The first tourists were New Zealand. This three-Test series, won 2-0 by the home side, showed that Pakistan were capable of playing beautiful and fluent cricket. The contrast with rancorous and damaging series that started just 6 weeks later, against a touring party sent over by the MCC, is striking. MCC ‘A’ team visited Pakistan in 1955-56 and is mainly remembered for the Peshawar incident in which some members of the MCC team roughed up the standing umpire Idris Beg. The MCC ‘A’ team came close to being asked to pack their bags and go home. Some seven team members of MCC travelled by tonga up to the Services hotel, adjacent to the cricket ground where both Idris Baig and the Pakistan team were staying. They abducted Idris Baig and took him on tonga, driven by England player, to Dean’s hotel. They made him sit down in a chair under the skylight where the buckets of water awaited him. 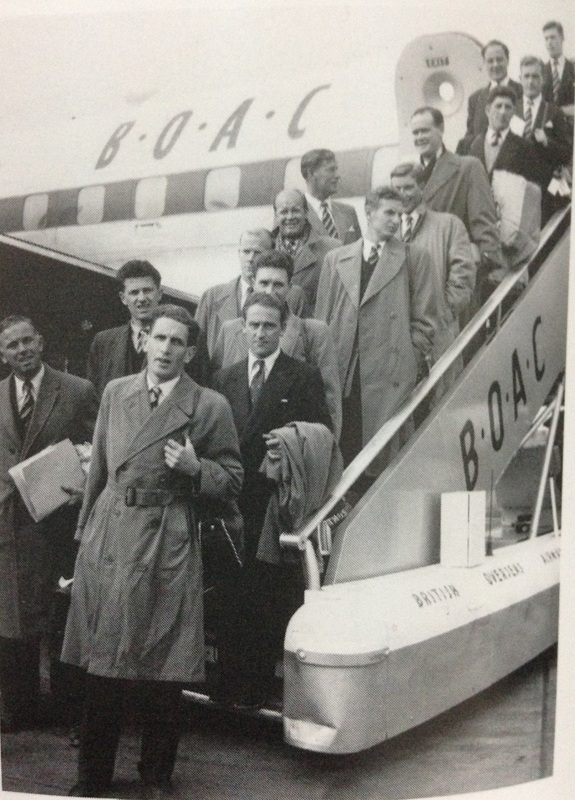 MCC tourists to Pakistan, 1955 – 56, arrive back at London Airport. The tour was marred by controversy following the treatment meted out to umpire Idris Baig. (Source: ‘Wounded Tiger’ by Peter Oborne. 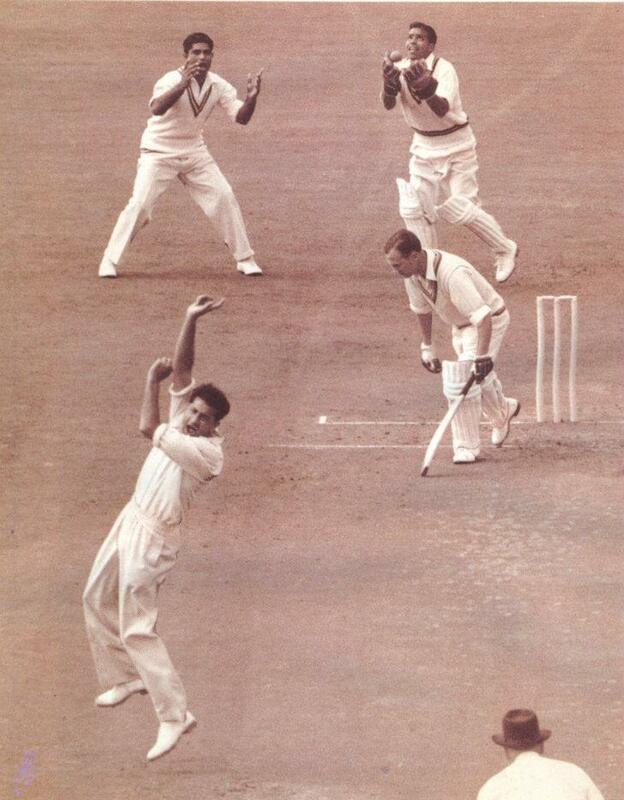 In 1956 Australia, led by Ian Johnson played a solitary test match at Karachi which Pakistan won convincingly on a matting wicket, Fazal Mahmood and Khan Mohammad being more than a handful for a tired Australian team that was returning from England after being soundly thrashed. The Australian side was full of famous names – Neil Harvey, Richie Benaud, Alan Davidson, Ray Lindwall and Keith Miller. 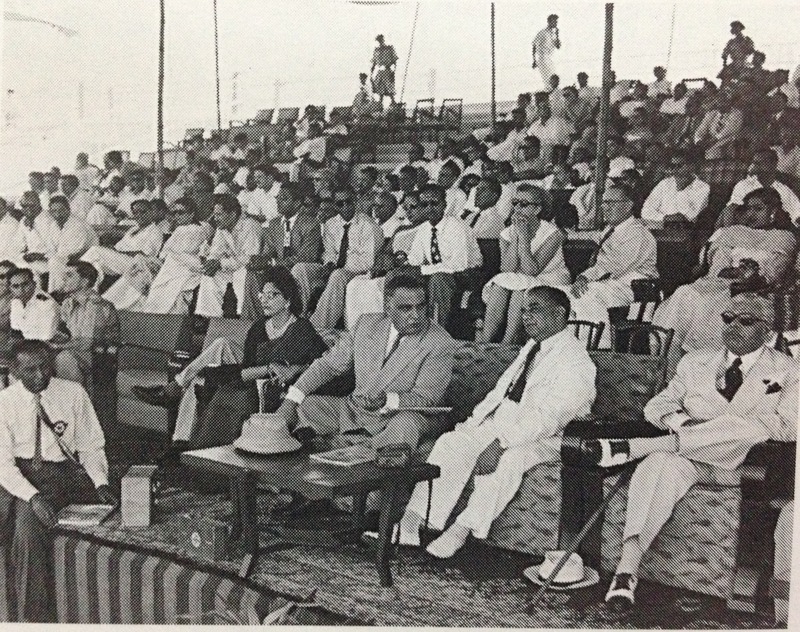 President Iskander Mirza watching Pakistan defeat Australia in October 1956. Mirza is sitting next to his prime minister, Huseyn Suhrwardy. (Source: ‘Wounded Tiger’ by Peter Oborne). 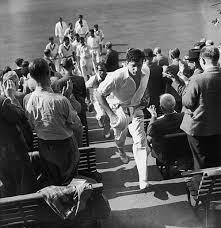 In 1957-58 Pakistan toured the West Indies, their first visit abroad since the England tour of 1954. It is hard to recapture today the magnitude of the journey upon which the Pakistan cricket team embarked to the Caribbean in December 1957. It was a team that left in high hopes but these hopes were dashed and Pakistan lost the series but was able to win the final test match. Two world records were established in this series. Gary Sobers passed Len Hutton’s record of 364, the highest in the test by an individual and made 365 in the Kingston test match, and Hanif Mohammad made a monumental 327 at Bridgetown, Barbados, batting for 970 minutes, and saving a test match that Pakistan seemed certain to lose. 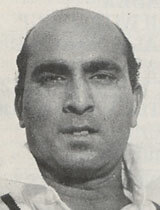 It established Hanif Mohammad as a legend of the game. Kardar retired after this series. Under his leadership, Pakistan had won at least one test match against every opponent. He had instilled discipline in the team and had drilled the will to win within the team members, something that Imran Khan was to do later. The departure of Kardar coincided with the collapse of civil administration in Pakistan, In October 1958, President Iskander Mirza proclaimed martial law, only to be overthrown himself a few weeks later by the man he appointed chief martial law administrator, General Ayub Khan. The provinces were divided into smaller local units and it reflected in cricket administration as well. The Punjab Cricket Association broke up into associations for Lahore, Multan and Rawalpindi, and the Sindh Association split between Khairpur and Hyderabad. The QAT in 1958-59 was dominated by an extraordinary batting feat in the semi-final between Karachi and Bahawalpur, the defending champions. Hanif Muhammad batted for mammoth 635 minutes and scored 499 runs when he was eventually run out while going for his 500th run. 29 year old record of Bradman for highest first-class score had fallen. Ayub Khan gave Hanif a specially struck Pride of Performance medal. 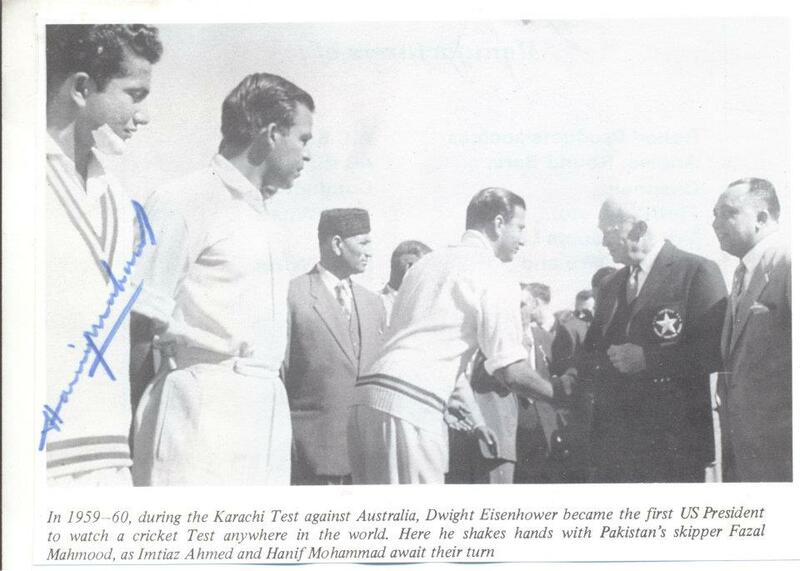 Fazal Mahmood took over the captaincy, a natural successor to Kardar, and met with immediate success when the West Indies toured Pakistan in 1958-59, winning the series though one felt that the umpiring standards left much to be desired. Gary Sobers failed to make any big scores and fell victim to some dodgy decisions. He makes bitter mention of the tour in his book. But at Lahore another two records were set. Mushtaq Mohammad at the age of 15 years and 124 days became the youngest player to play test cricket and Pakistan lost its first match on its soil. The West Indies, led by a blistering 216 by Rohan Kanhai romped home to an innings win. Richie Benaud’s Australians came in 1958-59. It was a disastrous series for Pakistan as it lost the three match series 2-0. After the third test match Ayub Khan was lobbied by Richie Benaud, who urged him for the sake of Pakistani cricket to eliminate matting. The new president and patron of BCCP listened to him and issued an order for all first-class grounds to install turf wickets. Thus Pakistan has Benaud to thank for the development of its cricket facilities. This entry was posted in Pak Tea House, Pakistan, Sports and tagged Australia, Cricket, England, Game, India, Pakistan, Sports, West Indies. Bookmark the permalink.